08-09-2014: TNPSC Group 2 Prelims December 2013 Exam Result Published on TNPSC's Official Website. Check your result soon. 02-09-2014 : In the last week of August 2014, TNPSC has informed the TNPSC Group 2 Preliminary Exam December 2013 will be published with in two weeks. So be prepared to face Mains Examination. 17-08-2014 : Now the TNPSC Group 1 Preliminary Exam also over. Though there is no official information from TNPSC about Group 2 Interview Posts Preliminary Exam December 2013 Result, we can expect the result soon . So don't waste your time, start your mains exam preparation with out delay. All the best ! 02-07-2014 : As per TNPSC 's Annual Planner 2014 - 2015, there is an another TNPSC Group 2 Interview Post Exam 2014 to be conducted this year. So start your preparation today itself. All the Best ! 28-06-2014 : TNPSC New Chairman ( Additional Charge ) Appointed . So we can expect the TNPSC Group 2 December 2014 Result soon. 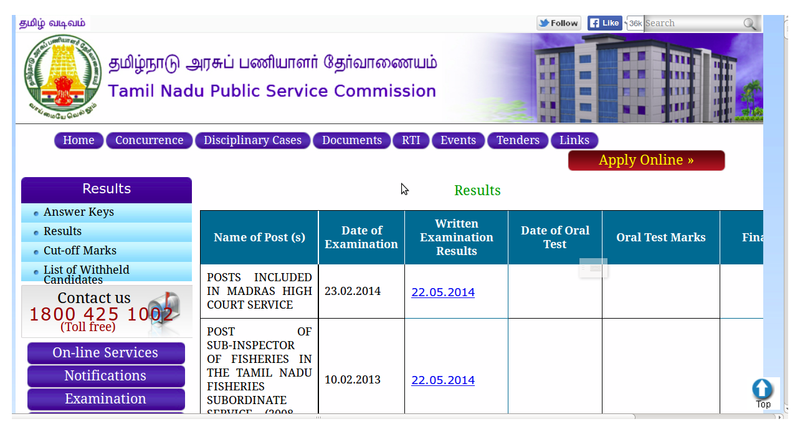 21.06.2014 : TNPSC Group 2 December 2013 Results are not yet published by the TNPSC. Now the TNPSC VAO Exam 2014 is over and today TNPSC announced its official answer key of TNPSC VAO Exam . Now all eyes on TNPSC for the Result of TNPSC Group 2 Interview Posts - Preliminary exam, which held on December 2013. Most probably, we can expect the TNPSC Group 2 Results with in this week or next week. Some time, before the TNPSC Group 2 A exam (29-06-2014) , TNPSC may publish the TNPSC Group 2 Interview Posts Preliminary Exam Results. You can see TNPSC Portal's Group 2 December 2013 Exam Expected Cut Off Marks and TNPSC 's Official answer key. Dear aspirants, be alert and prepared for the main exam, if you are confident in the expected cutoff marks. 15.05.2014 : TNPSC Group 2 Exam December 2014 results are most probably expected with in this week. The TNPSC Chairman earlier informed that the results of TNPSC Group 2 Interview Exam might be published in the last week of April 2014. So the results are expected to be published immediately after the Election results published (16-05-2014). 22.04.2014 : It is expected that the TNPSC Group 2 Interview Post Preliminary Exam result may be published immediately after the Parliamentary Election date (24-04-2014). This expectation is based on the TNPSC Chairman's interview to a newspaper two weeks before, he said that the Group 2 exam results would be published in the last week of April 2014. 02.04.2014 : After the release of TNPSC Group 4 Exam 2013 Results, its very hot discussion among all TNPSC aspirants ' When TNPSC Group 2 Non Interview Exam Results ?". Since this is the first Separate Exam for TNPSC Group 2 Interview Posts, there is a burning desire to know about the exam date. In the TNPSC 2014-2015 Annual Planner, it is said that the result will be published in the first week of February 2014 but till now there is no proper information from the TNPSC. The election commission already cleared its stand about TNPSC Exams, so the Parliamentary Election Model Code of Conduct will not affect the TNPSC Group 2 Interview Posts Exam Preliminary Exam Results. So the Result is expected very soon.